Here are the settings that you should use when encoding video for Screenlight when the video passthrough option is turned on for your account. If passthrough is turned off, you can upload virtually any video file and we'll create a high-quality, 720p proxy for you. 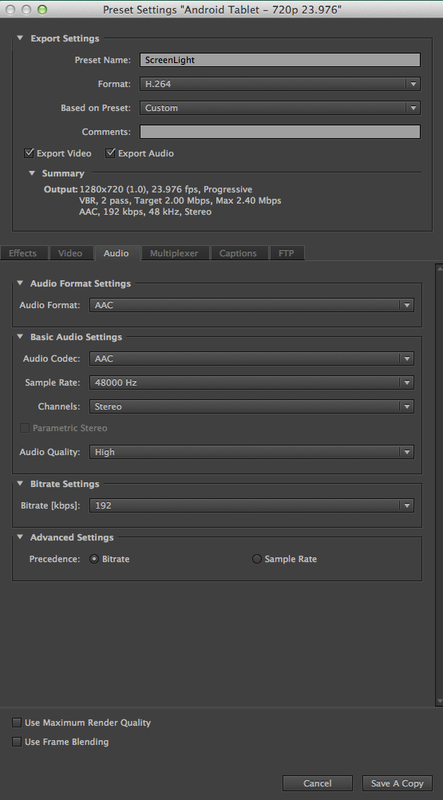 If you want to save a step, you can download the preset I have created and import it into Media Encoder Creative Cloud. 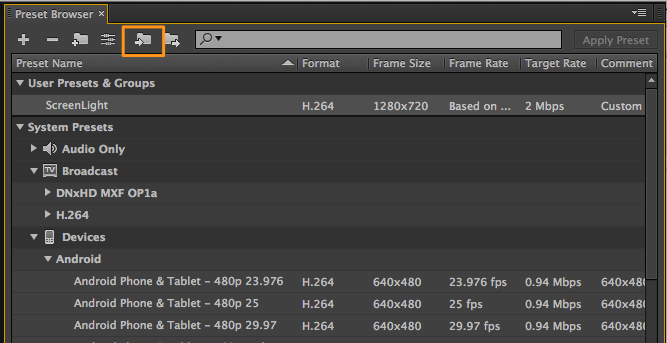 The Video pane of the presets template is where you'll enter most of your settings. You'll want to ensure that H.264 is the selected format. Ensure that the export video and export audio boxes are both checked. I have seen reports in the Adobe forums about people running into playback problems when they try to create an H.264 file without audio. A good starting point for review is to select a resolution of 1280x720 for 720p HD video. You'll want to ensure that the aspect ratio of your source file is preserved. If you are trying to save space in Screenlight, or you have clients with a slow connection, you could reduce the dimensions. Select the frame rate based on source. The only reason to change this would be if your source has a frame rate greater than 30fps. In this case, you would want to reduce the frame rate by half (ex. 48 fps becomes 24). Field order should be set to progressive. The other options for field order, if they are available, are related to television output and whether you want the output to be interlaced (which you do not want for the web). You will want to use square pixels for web viewing and leave the TV Standard to based on source. The latter setting is not going to have an impact on your encoding for the web. Use Main profile with Level 3.1 if your output is 720p or smaller and you want broad playback compatibility. 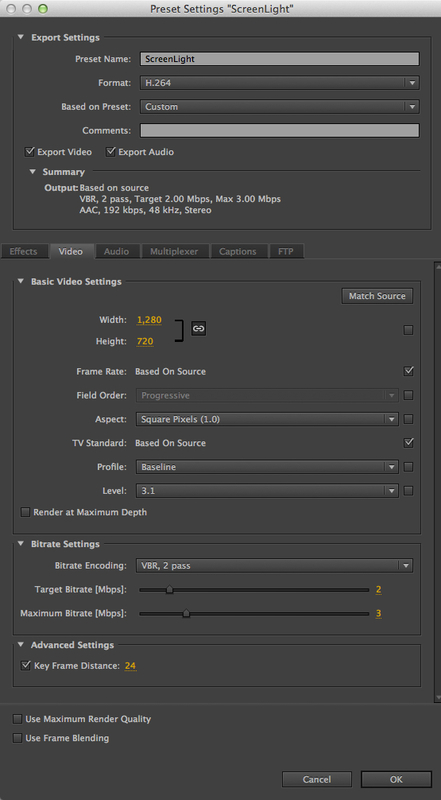 If your output is 1080p, you'll want to use High profile with Level 4.0. For Bitrate, select VBR, 2 pass. A target Bitrate of 2Mbps with a maximum bitrate of 3-5Mbps should provide a good level of quality. I have set the Keyframe distance to 24, which is approximately once per second. If you specify a shorter distance, the file size starts to increase fairly rapidly. For the Audio settings tab, use AAC as the audio format, with the AAC Audio Codec, a Sample Rate of 48000 Hz, Stereo, High Audio Quality and a Bitrate of 192 kbps. You can of course use a lower bitrate and sample rate if you are really trying to get the most out of your storage. On the Multiplexer tab, you should select MP4 and Standard Stream Compatibility. You don't need to set anything on the Effects tab unless you want to burn-in a watermark, add a burnt in timecode, or apply an LUT. Likewise, you don't need to change anything in the Captions or FTP tabs. To import the Preset that I created, open Adobe Media Encoder and go to the preset browser on the right side of the screen. 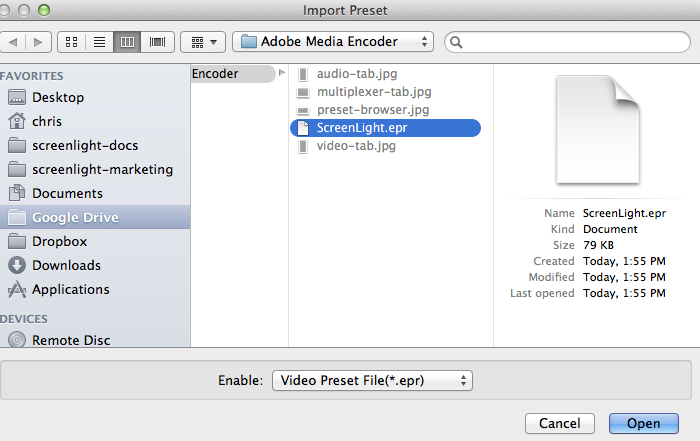 Click the "Import Presets" button as indicated below. Find the preset you have downloaded from our site and select it. 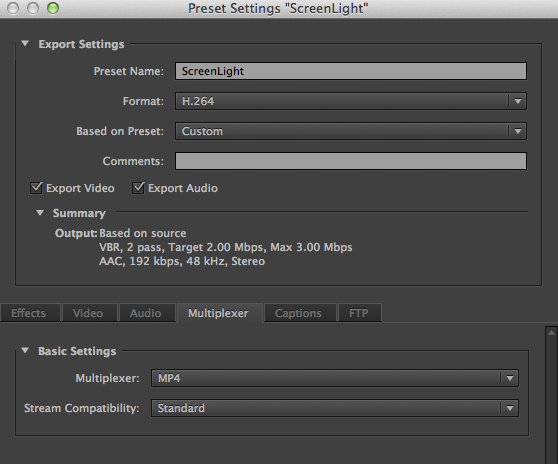 Once you have finished the import, the " Screenlight preset" will appear at the top of your list of presets in the section called "User Presets & Groups". You can of course edit the preset to match your own particular needs, or even use it as the base for a series of different presets.